This blog is All About Samhain. Hello readers, and welcome to Witchlike! Today’s topic is – quite appropriately – Samhain, also known as Halloween, candy day, trick-or-treat, my-excuse-to-egg-houses, or when-will-those-damned-kids-stop-ringing-the-doorbell. Would you believe there is a sacred tradition of honor and charity behind all that? First of all, have you ever wondered what would entice people to dress up in funky costumes, run around the street and go door to door expecting candy from strangers? Although in my world it sounds like a perfectly acceptable practice, most folks would agree that this is a little strange. How did this bizarre custom get started? In order to understand the origin of Halloween, we first must understand Samhain. In the Pagan year calendar — that is, the wheel of eight — Samhain is celebrated on November 1st and marks the official end of summer. Samhain literally means ‘Summer’s End’ in the ancient Celtic language. (That’s right, kids! Summer really does last until Halloween!) November 1st is the midpoint between the autumn equinox (September 23rd) and the winter solstice (December 21st). Believe it or not, the Pagan calendar is actually based on scientific, astronomic and cosmic principles which all have to do with the orbit of the earth in relationship to the sun. So that is how we determine the actual start of winter. Now, you ask – what does this have to do with those funky costumes and candy? Patience. I’ll get to it. Samhain, as the end of summer, signifies a lot of different things. You may have noticed plants dying, leaves falling, the world around us changing and going in to hibernation for the next few months. This dying stage of natural things also signifies human death. During this time, it is believed that the veils which separate the living from the dead are very thin – hence it is a good time for divination and séances. In more practical terms, it is also a harvest, time to bring in the last of the summer crops. Traditionally, because it was a farming society, this was a time to store the grain, kill the pigs, salt the meat and make preserves. Which, I admit, does not sound like a whole lot of fun. But I am getting to the fun part. Sometime in the Middle Ages, with the rapid growth of Christianity, the Christian church adapted its own version of the wheel of eight Pagan holidays. This was done in order to make the conversion to Christianity more palpable for former Pagans. 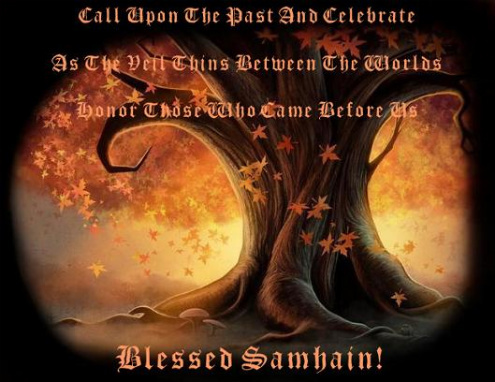 Samhain, in its newly adapted form, became ‘All Soul’s Day’ or ‘All Saint’s Day’. Based on the dying world around us and the close proximity to the dead, the Church made this a day to honor the dearly departed, especially if they had achieved sainthood. The night before Samhain, October 31st, became known as ‘all soul’s eve’ or ‘all hallow’s eve’. Hallow meaning ‘halo’ – assuming the dead are in heaven and wearing halos. How did it get to be ‘Halloween’? This would be an American question. If you take a look at Olde English, spoken with, say, Scottish and Celtic accents, you will see that this is a bit of the words running together. Halo-ed evening becomes hallow’d even, or even quicker, hallow ‘een. Kind of like how Auld Lang Syne really means ‘old, long ago times’. But that is another blog entirely. In the Middle Ages costumed entertainers called ‘mummers’ were known to take to the streets, decked in all kinds of masks, for various occasions. (Thus proving that Medieval folk were not always the dark, somber and demented people we make them out to be.) For Hallow’s Eve, this meant wearing costumes of the dead. Those gone to the precarious afterlife might include ghosts, goblins, etc. What about pumpkin carving, and placing a candle in the hollow center? Jack o’ lanterns were traditional lanterns used to guide one’s way into the underworld. Betcha didn’t know that, eh? There was also a tradition of giving extra food to the poor on these holidays. So, on during Hallowtide, it became perfectly acceptable for poor children to go door to door begging. The treat that was given might be a piece of fruit, bread or cake, all of it called ‘soul cake’. Although you were not officially obligated to give a soul cake, it would be in your best interest to do so. Otherwise some nasty peasant might come back and destroy your barn. Give them a treat, or else they might play a trick on you. See that? Hence the first Trick-or-Treaters came to be. I am all for the gala and craziness of this holiday. Costumes, candy, parties, bring it! In these magick- lacking-techno-crazed-way-too-serious-post-modernistic times in which we live, we should find any excuse to celebrate! But I would also encourage people to look at the spiritual side of Samhain. This is really a time of reflection, a time to honor the dead, bless the harvest, and, also to contemplate the veils. Some of the more spiritual things we can do at this time: Visit a cemetery. Meditate in the quiet peacefulness of nature. Take a walk in the forest and notice the beauty, while leaves are still red gold. Contemplate the brevity of seasons and the brevity of life itself. This helps us appreciate things. Find a personal way to communicate with your own ancestors, those you admire from the past, or your own recently departed. If you are into it, conduct a séance. Honor the harvest. Bake bread and pies. If you carve a jack-o-lantern, save the seeds and roast them in the oven. (Pumpkin seeds are good for you – full of calcium, magnesium and potassium!) Decorate your house with marigolds and the last of the summer flowers. Donate non-perishables to your local food pantry. A charity bag could be your own personal ‘soul cake’.